Some time ago I had the opportunity to see the 104-bay Newisys 4U storage server. Given some of the design constraints, I was not sure if I would see a larger system. 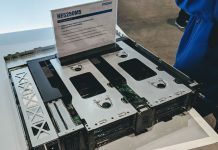 At SC18, Inspur showed off a 106x 3.5″ hard drive server. The Inspur NF5486M5 is an absolutely massive machine. 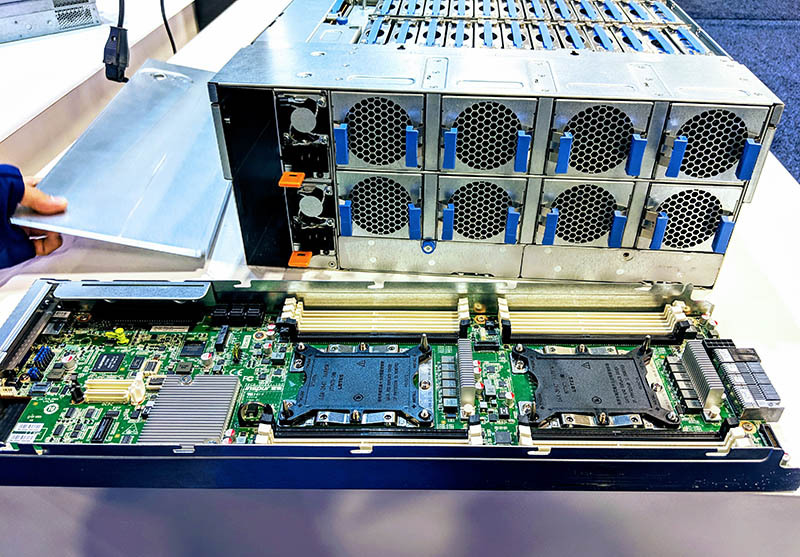 This is a compact node yet it has eight DDR4 DIMM slots as well as OCP mezzanine networking and a PCIe 3.0 x16 slot. When using SAS/ SATA drives, one may immediately notice there is no HBA on the server node. Instead, the drive connectivity is through two edge connectors on the hot swap tray. Here there are 106x 3.5″ top loading hard drive bays. 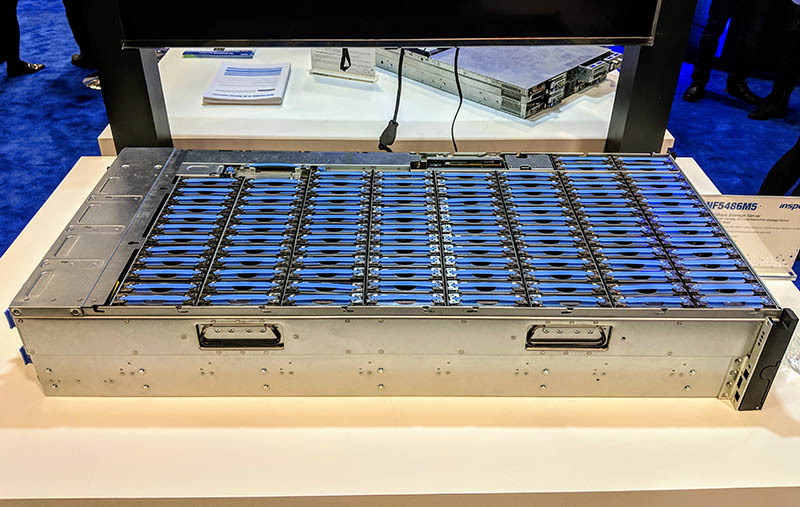 For some perspective, that means this server is capable of around 1.5PB per 4U, or about the amount of storage a higher-end NetApp or Dell EMC rack-scale storage system would have had just a decade ago. 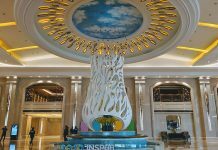 Inspur designs systems for many large cloud providers. As a result, this solution has features such as the ability to power on/ off drives as well as the ability to have hard drive zone management as well. A design consideration is that these 106 hard drive chassis are heavy. Modern helium-filled hard drives of 10TB or greater capacities weigh about 1.5lbs each. As a result, 106 drives alone will weigh around 160lbs and a total system can weigh over 250lbs. Often these storage nodes sit at the bottom of racks or come in heavy-duty racks to support the safe shipping and installation of these systems. Storage is one area where bigger is usually better and 106 hard drives is simply massive.